Jesus' General: Don't call them "Crazy Eyes"
Don't call them "Crazy Eyes"
It's sad when our greatest anchor baby patriot, a heroine of the fight to bring back concentration camps, stumbles in the defense of the One True Presidential Candidate. 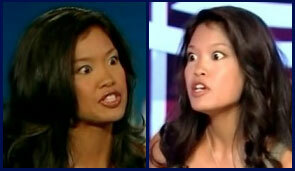 Unfortunately, that's what Michelle Malkin did when she called out Newsweek for publishing a photo of Michele Bachmann's "crazy eyes." I'm sorry Mrs. Malkin, but Mrs Bachmann doesn't have "crazy eyes." True Christians see her eyes for what they truely are: the "Eyes of the Anointed," the eyes God employs to mark His chosen. They are the eyes Mrs Bachmann uses when she rebukes sorcerers, witches, and teachers. 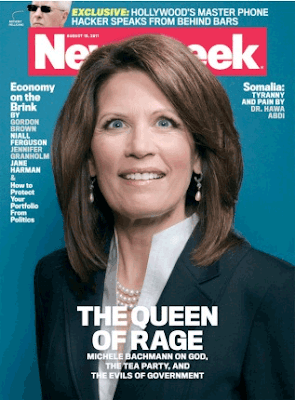 They are the eyes she used to drive the demons from the Bachmann family goat. They are the eyes she uses to keep her husband, Marcus's, homosexual demon at bay. They are also the eyes God gave Mrs Malkin to use in melting her enemies' secret parts. Rather than calling these eyes, "crazy eyes," Mrs. Malkin should cherish them, embrace them, and thank Jesus for bestowing them upon her.